"The most comprehensive and interpretive study of the mining industry available to historians. . . . It is a book that will stand the test of time." "Mark Wyman's sympathetic account of the Western metal miners includes graphic details of their bitter struggle for unpaid wages, for industrial safety legislation, for corporate liability in the event of mine accidents and for workmen's compensation. . . . Throughout the book one finds the compassion and understanding that mark works in the best tradition of historical scholarship." "Wyman has looked at miners in the larger context of American industrialization during the late 19th and early 20th centuries. In doing so, he has produced a stimulating, informative account of how this group of workingmen responded to changes in the work place brought on by changes in technology, corporate capitalism, and the shifting labor forces of the day." "Wyman's compassionate and thoughtful study is an important contribution to the social history of western mining. 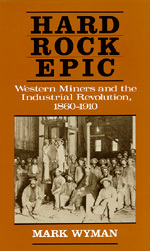 Hard Rock Epic is also a significant addition to the literature on the process of industrialization. It amply demonstrates that no group in the American West was so deeply affected by the Industrial Revolution as the hard rock miners." "Hard Rock Epic is both a descriptive and analytical study of the impact of technology on the life of metalliferous miners of the West. It is thoroughly researched, drawing heavily upon primary sources and the most relevant recent scholarship concerning the hardrock men. The study is judicious and balanced. . . . [and] fits well into the growing body of scholarship on Western metal mining. Historians of labor and the American West will find this volume instructive and definite contribution to their fields of study." Mark Wyman is Professor of History at Illinois State University, Normal.